In 1629, the natural philosopher René Descartes enticed a young artisan to undertake a secretive project, one that promised to revolutionize early modern astronomy. 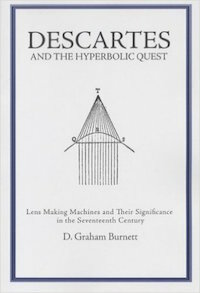 Descartes believed he had conceived a new kind of telescope lens, shaped by the light of reason itself, & surpassing anything ever to come from the hands of the glass-working craftsmen of the era. These novel lenses would never be touched by human hands -- they would be cut by an elaborate machine, a self-regulating & automatic device. This study traces the inception, development, & finally the collapse of this ambitious enterprise, which absorbed the energies & attentions of a broad range of 17th-century savants, including Huygens, Wren, Hevelius, Hooke, & even Newton.